Proper rug cleaning /rug washing of your valuable Persian rug is essential to maintaining its wearability as well as its beauty. 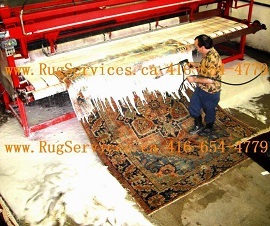 Rug cleaning / rug washing will soften and shine the wool as well as remove abrasive soil from the rug's foundation. 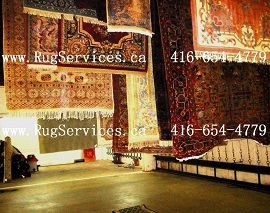 We offer the best Rug cleaning in Oakville, a thorough rug cleaning / rug washing process designed specifically for Persian and Oriental rugs. 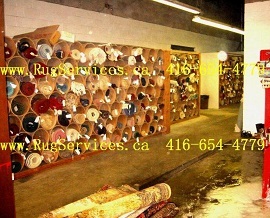 Each rug is treated individually with special attention and care. 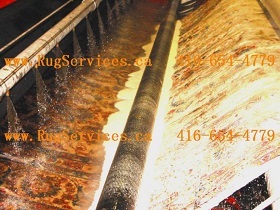 We utilize the best rug cleaning / rug washing technique and method in Oakville that suits each rug's particular weave, fibers and dyes. 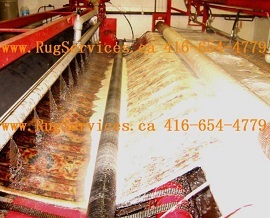 Our method of rug cleaning / rug washing is a series of procedures starting with a thorough inspection of your rug before any rug cleaning / rug washing steps, followed by dry soil removal with high volume compressed air referred as Air Dusting. The rug cleaning / washing procedure continues with a complete immersion and gentle bubble bath with compressed air for optimum soil removal. The final step before drying is a thorough Rinsing that leaves us with clear rinse water. 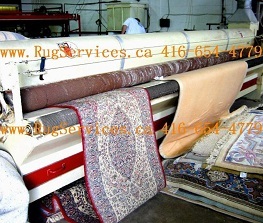 Our specialized technicians examine all areas of the rug including the fringe, main body and side edges of each rug upon arrival. Any damage, spots or stains is recorded to allow us protect the rug from further damage during cleaning. One of the most important tasks is removing all dry soil and dust from the rug. This step must be done before undertaking any rug cleaning procedure involving water. Our specially designed air-dusting machines remove several pounds of dry particulate, dust, debris soil and loose fiber from an Area rug. Air-dusting procedure may take 30-60 minutes to complete and it allows the colors in the area rug to come alive and bright. Upon completion of air-dusting step, we begin a dye-bleed test to ensure that each color of the rug is stable and will not run during rug washing or drying process. Rug washing consists of two steps: Soaking the rug in three to four inches of water to reduce soil, dirt, and spotting through water saturation and adding gentle rug cleaning products that are designed specifically for natural fibers. These products are gentle on the fibers yet strong enough to remove tough soils. At this point we gently brush area rug cleaning products into the rug for few minutes. Then we begin to give it a gentle bath using compressed air. While this is being done, fresh water is continuously added into the fibers removing all cleansing fluids. 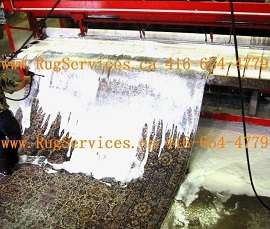 To ensure that all residues are removed from the fibers, during last step of persian rug cleaning / rug washing we are constantly adding fresh water and removing soiled water until clean, clear water and a thoroughly washed and rinsed area rug is gained. As the area rug cleaning procedures are complete we hang the rugs on a custom drying tower where different levels of heat, temperature, and airflow are tailored to individual rugs' needs. The grooming step of rug cleaning process is attended by setting the pile in the proper direction and gently combing the rug fringe. After rugs are completely dry, they must pass final inspection. At this stage of rug/carpet cleaning we ensure the rug is as clean as possible. In case it does not meet our standards, the rug will undergo the cleaning process again.